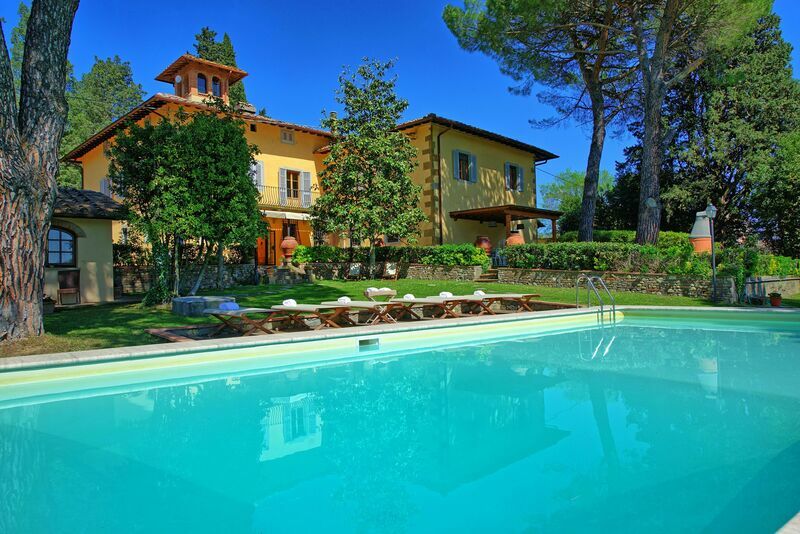 Splendid, ancient Tuscan villa dating back to the 17th century, owned by the Posarelli family, completely restored and set inside a large property of 90 hectares surrounded by olive groves and vineyards. The villa offers enchanting panoramic views over the surrounding landscape and over San Gimignano in the distance. The villa interiors are tastefully furnished with some antique pieces. Beside the main house, this property also offers a small outbuilding with double bedroom and ensuite bathroom by the pool. Distances: Sciano with food shop and pizzeria approx. 5,5 km, Barberino Val D’elsa with all kinds of shops and tennis court 6 km, Certaldo approx. 6 km, San Gimignano with its beautiful towers dating back to the medieval period approx. 30 km, Florence about 40 km. Siena and Volterra are in a 45-minute drive. The medieval hamlet of S. Appiano and Linari worth a visit. The small and charming village of Petrognano with ruins of the town of Semifonte destroyed in 1202 by the Florentine, is in a short distance. At guest’s disposal: large, fenced and furnished garden (5.500 m2), private swimming pool (12,5 x 6,5 m – maximum depth 2,5 m), nice porch ideal for al-fresco dining and barbecue area. Extra services: baby bed is available by arrangement at € 50,- / per week to be paid locally. Maid and cook service for excellent meals based on Tuscany recipes available by arrangement (price to be agreed at the time the booking is confirmed). The wine and the olive oil produced in the property as well as fresh vegetables of the backyard are available for clients to be purchased. The area surrounding the property offers and ideal terrain for nice walks.